Save even more on mWax with our 12 packs. 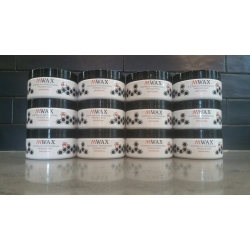 mWax has been designed and developed by Soft Tissue Therapists to their desired consistency. mWax won't spill, won't drip and travels exceptionally well. Two natural products, bees wax and canola oil, blending to create the ideal treatment lubricant. mWax has the natural anti bacterial and skin rejuvination properties of beez wax. mWax is very easy on towels. Easy to wash with no oily smell when dried. mWax is a completely owned and manufactured Australian Product. The wax is from Harden in NSW, the Canoloa oil is from Cootamundra NSW, the jar manufactured in South Australia and the stickers in Queanbeyan.